Over the course of the presidential campaign, Donald Trump and his allies have argued that the controversy surrounding Hilary Clinton’s private e-mail server would cause a constitutional crisis, if the former secretary of state happened to be indicted following her victory in the upcoming election. While no one knows what the FBI will discover, Secretary Clinton can take comfort in the knowledge that claiming to have mistakenly mishandled classified information is not as shocking as say, a sitting vice president being indicted for murder. Such was the case with Aaron Burr, who was charged with murder in New York and New Jersey following his duel with Alexander Hamilton. When the confrontation occurred on July 11, 1804 in Weehawken New Jersey, the charismatic Burr was nearing the end of his one term as Thomas Jefferson’s vice president. Jefferson’s party had won a controversial election four years earlier following a deadlock in the Electoral College that had caused the election to be decided in the House of Representatives. Following Hamilton’s lavish funeral on July 14, Burr was stunned that the duel had caused so much controversy. “All our intemperate and unprincipled Jacobins who have been for Years reviling H [Hamilton] as a disgrace to the Country and a pest to society are now the most vehement in their praise,” he wrote to his friend Charles Biddle. The anger that Burr displayed in his note to the prominent Pennsylvanian, was due to the vice president’s belief that the many enemies he had accumulated throughout his political career were now finally hoping to get satisfaction. Burr also speculated that those who were allied against him were responsible for impaneling a coroner’s jury in New York with the goal of indicting him for murder just days after Hamilton’s death. On July 21st, a week after the funeral, Burr made his way to Biddle’s home in Philadelphia where he believed he would be safe from capture. In the weeks following his departure from New York, authorities determined to indict the vice president for murder had become frustrated as one jury after another had refused to concur with the prosecution’s argument. Finally, on August 2nd following their fourth effort to secure charges, an indictment of murder against Burr was handed down. “The motives are obvious. Every sort of persecution is to be exercised against me,” Burr wrote his daughter Theodosia, as he sat in Philadelphia convinced the accusations against him were entirely politically motivated. The vice president had a point. 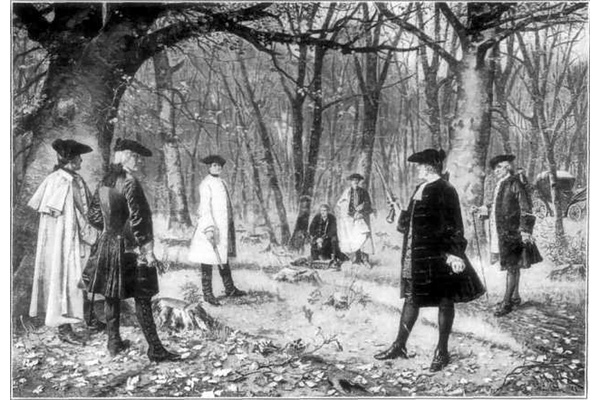 As historian Joanne Freeman argues, since dueling was considered a gentleman’s activity used to resolve disputes in matters of honor, it was virtually unheard of to indict someone for killing an opponent in that kind of confrontation. Those who engaged in the activity were viewed as members of the elite whose wealth and political connections gave them the appearance and at times the reality of being beyond the reach of the law. to be even more ridiculous than those in New York. Despite dueling being viewed unfavorably, even by the state’s governor it was not considered illegal. Historia Nancy Isenberg argues the charges against Burr had been arranged by Federalists to cast doubt on the vice president’s character in order to create turmoil and distrust toward Thomas Jefferson and his party. When Burr strolled into the Senate on November 4th, the New York Evening Post was “astonished to find the second magistrate presiding in the first branch of the Legislature, which he stands indicted for murder.” Burr’s duties also required him to preside over the impeachment trial of Supreme Court Justice Samuel Chase, which was to begin in January. The situation was ironic to say the least, as the vice president, now a wanted felon in two states, was overseeing a trial of another public official. Despite his own criminal status, Burr was not removed from his position. Since Hamilton had not been killed in New York, the state chose to withdraw the murder indictment, charging Burr instead with the lessor crime of violating the laws against dueling. Burr attempted to get the charges dropped in New Jersey as well by lobbying New Jersey Governor William Bloomfield. By the time those charges were quietly dismissed, Burr was no longer vice president having been replaced by another political rival, former New York Governor George Clinton. When Jefferson and Clinton were inaugurated in early 1805, Burr’s political career was over. His reputation in tatters and in financial debt, Burr soon became involved in a conspiracy to seize territory in the western part of the United States for which he was tried and then acquitted of treason. Despite Burr being exonerated he never returned to politics. After a brief sojourn in Europe, Burr returned to New York where he practiced law until his death in 1836. So, for all of Secretary Clinton’s difficulties she can take comfort in the fact that while many may view her situation as dire, Aaron Burr’s was far worse.